This small spaniel has a long silky coat with a ruff covering the neck and chest. Japanese Chins are fine boned with an elegant high stepping gait. They have long feathered tails that are carried over the back. Japanese Chins are playful and clever. Japanese Chins originated in Japan. Japanese Chins range from 7 to 11 inches (18 to 28 cm). Japanese Chins can weigh up to 9 pounds (4kg). The Japanese Chin's fine silky coat comes in white with colored patches, most often black, but sometimes red, yellow, orange, sable or brindle. 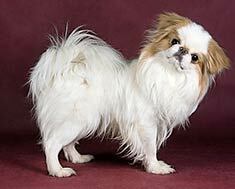 The Japanese Chin has a long silky coat which must be brushed twice a week. Japanese Chins are average shedders. Japanese Chins have been known to make up their own tricks to entertain their owners. They are sweet and playful and love to be the center of attention. This breed is better suited for the elderly or households without children. Japanese Chins make excellent watchdogs. Some Japanese Chins are prone to patellar luxation, roach back, premature loss of teeth, heart murmurs & congestive heart failure, juvenile cataracts, seizures and umbilical hernia. Japanese Chins can be expected to live 12 to 18 years. Japanese Chin's can do well in small living spaces with fairly little exercise; however they enjoy daily walks and free romps in safe enclosed spaces. Japanese Chins are in the Toy Group. The toy-sized Japanese Chin was bred only for the purpose of entertaining and loving people. Often confused with the Pekingese, Shih Tzu, or Lhasa Apso, the Chin has a straight, silky single-layer coat and a tail that curls up over his back. Where did the Japanese Chin originate? This may be a bit like asking who is buried in Grant's tomb, but the answer may surprise you! It is thought that these dogs, despite their name, actually originated in China and were given to the Empress of Japan as early as the 6th or 7th century. Fossilized remains dating from as early as the 8th millennium BC indicate that the Japanese Chin descended from the Gobi Desert Kitchen Midden Dog of Tibet, which also gave us the Tibetan Spaniel and the Pekingese. The dogs were likely brought to America by Matthew Calbraith Perry after a visit to the Orient in 1853 on a trade mission. He was given seven Japanese Chins, but only two survived the voyage home. Commodore Perry presented the two remaining dogs to his daughter, but the dogs died before producing any offspring. Subsequent voyages by other sea captains resulted in more of the tiny royal dogs being brought to the United States. Unfortunately, these dogs had no immunity to western diseases like distemper and many died very young. Enough members of the breed survived to be accepted into the American Kennel Club in 1888, where it was known as the Japanese Spaniel until 1977. 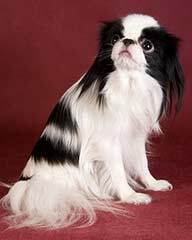 The Japanese Spaniel Club of America was founded in 1912 and remains in operation today under the name of Japanese Chin Club of America. What does the Japanese Chin look like? Each of the noble houses bred Chins to their own standards, resulting in many variations in the breed. However, the current breed standard specifies that the dog be 8 to 11 inches high at the withers and weigh between 4 and 20 pounds, most commonly between 7 and 11 pounds. The Chin’s straight, silky hair is usually black and white, but may be red and white, sable and white, or tri-color. The tail is feathered and carried curled up over the back, with long hair hanging nearly to the floor. A Chin puppy will lose his full coat somewhere between 5 and 12 months of age, resulting in near baldness. This is normal and no cause for concern. He is simply losing his puppy coat, and the full adult coat may take 2 – 3 years to grow in fully. Un-spayed females will also molt most of their coats after ending their heat seasons, generally ending up with thinner coats than males and spayed females. Facial features include a short, upturned muzzle and large, wide-set eyes with the whites visible in the inside corners. The ideal coloring of the head fur includes a white hourglass-shaped patch just above the face with a black blaze in the middle of the patch. This area is known as Buddha’s thumbprint, reflecting the importance of Asia in the breed’s history. 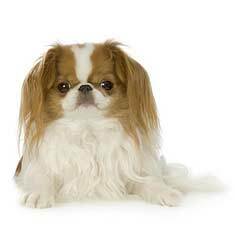 The Japanese Chin is sometimes confused with the Pekingese, although the Peke has a double coat and heavier feet than the Chin. Other breeds of confusion include the Lhasa Apso, distinguished by his almond eyes, and the Shih Tzu, which has less prominent eyes. Although frequent (i.e.daily) combing is needed to keep the coat soft and lustrous, the single-layered coat does not require frequent bathing, as it does not trap odors and dirt. If you are not showing your dog, you may opt for a shorter “puppy cut” rather than the traditional long flowing hair that needs daily attention. The large eyes often “weep”, causing the skin folds of the face to remain damp. These should be wiped with a clean cloth occasionally and / or cleaned with a cotton swab to prevent fungal infections. How does the Japanese Chin act? The Chin is sometimes referred to as cat-like because he is independent and washes his face with his paws. In addition, he prefers to rest on high surfaces such as chair backs and kitchen counters, when allowed. He can also be found weaving among collectibles on a coffee table without disturbing even one of them. In addition, the Chin is alert, intelligent, and independent. He is a loving and loyal companion dog that does not insist on being a one-guardian dog. He is equally happy to see anyone, and thus does not make a great watchdog. The Chin is basically a quiet dog, but enjoys entertaining his humans with his signature “Chin Spin”, where he turns in fast circles, dancing on his hind legs. Some Chins even sing while carrying out this maneuver. The Chin easily adapts to his surroundings, becoming outgoing in a rambunctious home and quiet and shy in a home that includes only reserved adults. What health problems do Japanese Chins have? The Chin is prone to food allergies, with corn often being the culprit. Finding a high-quality pet food that doesn’t include corn is sometimes difficult, but well worth the effort because the dog’s coat and skin appearance will improve dramatically when corn is removed from the diet. Due to his flattened face, the Chin often breathes loudly and has a hard time cooling himself by panting to remove the summer’s heat. His short palate is often unable to temporarily block the dog’s airway when he sneezes, resulting in wheezing, which will go away when the dog swallows. Wheezing which continues for longer than a few minutes may require a trip to the veterinary clinic to assure there is no underlying trauma. Like all small dogs, the Chin has a delicate airway. It is recommended that leads be attached to your dog via a harness rather than by a collar to prevent damage to the trachea. The typical lifespan of a Japanese Chin is 10 – 12 years, and they suffer from fairly common genetic diseases such as patellar luxation, cataracts, and early-onset heart murmurs. Luxating patellas are caused by a malformation of the knee joint which allows the kneecap to slip sideways off of the joint. It is common, particularly in small dogs, and must be corrected surgically. Cataracts occur when the lens of the eye becomes thickened and loses its translucence. This can happen as the result of trauma, diabetes, nutritional deficiencies, or genetics. Treatment is the surgical removal of the diseased lens and the insertion of a prosthetic. The most common cause of heart disease in small-breed dogs is a degenerative disease of the heart’s valves, most commonly the mitral and tricuspid. As the valves degenerate, the heart is less efficient at pumping blood out to the body’s tissues. About 35% of all dogs over the age of 12 show some signs of endocarditis, but toy breeds are susceptible to early onset of the problem, which can lead to congestive heart failure and very early death. There is no real treatment for the problem; breeders must take care to screen out dogs from the gene pool which show any early onset of valve issues. If you are looking for a highly adaptive dog who can live comfortably in a large home or small apartment, with or without children and other pets, the Chin may be just perfect for you. However, you must be aware of the intense grooming required to keep a Chin’s coat long and silky, and you must be prepared to commit to the dog for its long lifespan, which may last up to 15 years. Find Japanese Chin Puppies with our Free Breeder search!